Srinagar, July 10, (Scoop News)- Two militants were killed and a security personnel was injured today in an encounter in Shopian district. 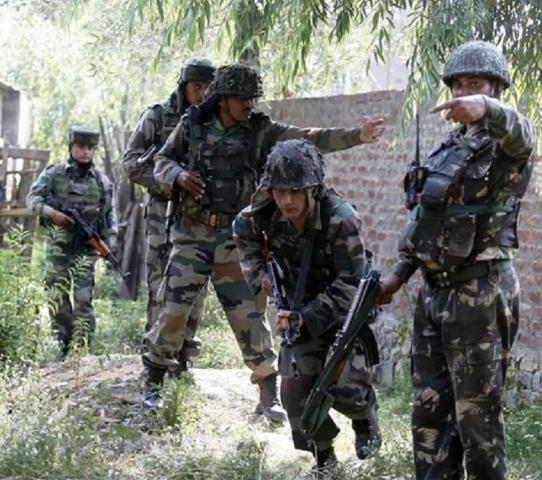 Pursuing credible leads regarding the presence of terrorists in Kundallan area of District Shopian, a joint patrol of the security forces launched searches in area in the wee hours today police said.,. According to Police spokesman as the searches were going on, terrorists hiding inside the house fired upon the search party. The search party in their guarded response fired back thereby establishing contact with the terrorists leading to an encounter. Some of the civilians in the nearby houses were quickly evacuated by the security forces. He said that during the encounter all the hiding terrorists were eliminated successfully by the joint patrol of the security forces. The killed terrorists were identified as Sameer Ahmad Sheikh a local and Babar from Pakistan. They were affiliated with proscribed terror outfit JeM. Sameer Ahmad Sheikh son of Ghulam Mohammad Sheikh resident Rawalpora Shopian was a school dropout and had joined the terrorist outfit JeM after he was reported missing from his home since April 2018. On the basis of documents available the other terrorist has been identified as Babar a JeM commander of Pakistan origin. They were involved in many attacks on the security establishments and civilian atrocities. Some civilians were also injured in cross firing at the site of encounter who were later evacuated to the hospital for medical attention. One of the injured persons later succumbed to his injuries while the other injured are stated to be stable now. Some arms & ammunition were also recovered from the encounter site. Police has registered a case and investigation has been initiated in the instant matter.